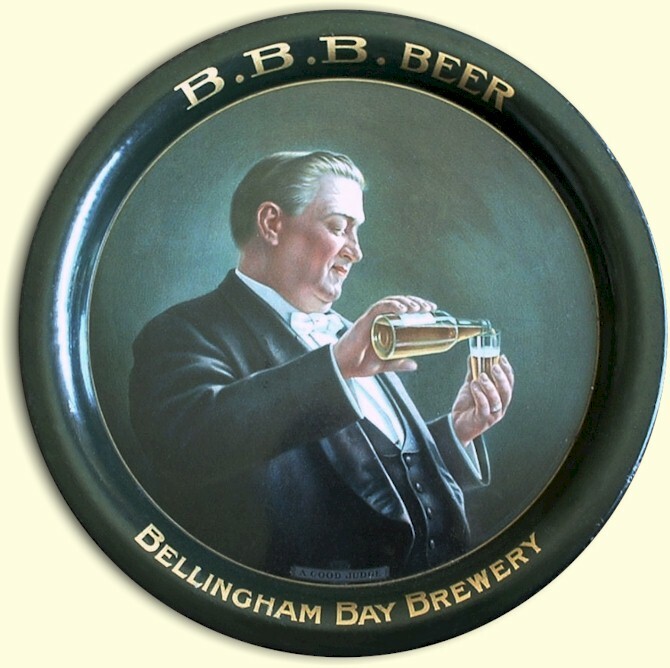 The history of the Bellingham Bay Brewery [3-B] began when Leopold F. Schmidt, president and owner of the Capital Brewing Company of Tumwater, soon to become the Olympia Brewing Company, chose the site for the company's newest brewery. He selected the city of Whatcom as the site for his new plant as it was ideally located on the northern end of Puget Sound, in the northwest corner of Washington State. Situated on Bellingham Bay, the mill town made an excellent distribution hub. It had, not only a fine seaport with the largest and most perfect landlocked harbor on the Pacific Coast, 25miles nearer the ocean and l00 miles nearer Alaska than any Puget Sound rival, but was also served by the Bellingham Bay & British Columbia Railroad. Plus, the BB & BC connected with a terminus of three transcontinental railroads: the Great Northern, the Northern Pacific, and the Canadian Pacific railways. This water & rail distribution advantage was reflected in the 3-B trade mark (above) - reg. 31 Sept. 1902. Schmidt stated that the plant will be employed almost entirely in supplying the growing foreign trade in export lager beer from the Pacific Coast. "It is reported that a brewery will be erected in New Whatcom, Wash., at a cost of about $70,000, by the Capital Brewing Co., a site for that purpose having already been secure." "For Pure Beer, For Pure Ice, call the Olympia Brewing Company, telephone Main 31....No. Elk & Ohio." Elk St. was later changed to Ellis St.
Actual construction of the Bellingham Bay Brewery began on January 10, 1902, but this was not the first brewery to bear the 3-B name. 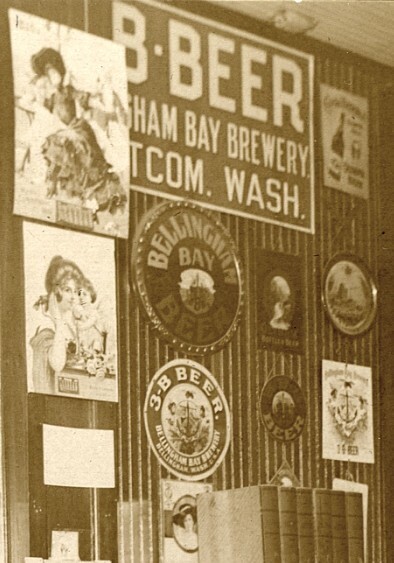 While not affiliated with Schmidt's future brewery, a "Bellingham Bay Brewery & Saloon" was est. in 1885 by Jacob Beck. The source for his brewery's water was Chinook Creek, and it's probable that it was a water quality issue that terminated production of his 5¢ a glass "Whatcom Beer" for after only one year he closed his brewery. He later built the landmark Beck's Theater at a cost of $155,000, then the largest and finest opera house in the West, seating 2,200. "Bellingham Bay Brewery to Commence Operations - The big Bellingham Bay Brewery is completed. The machinery has all been installed and tested and is now ready for operation. The first brew will be made next Monday or Tuesday. The Bellingham Bay Brewery is the finest brewery west of Chicago and the equal of any in the United States. 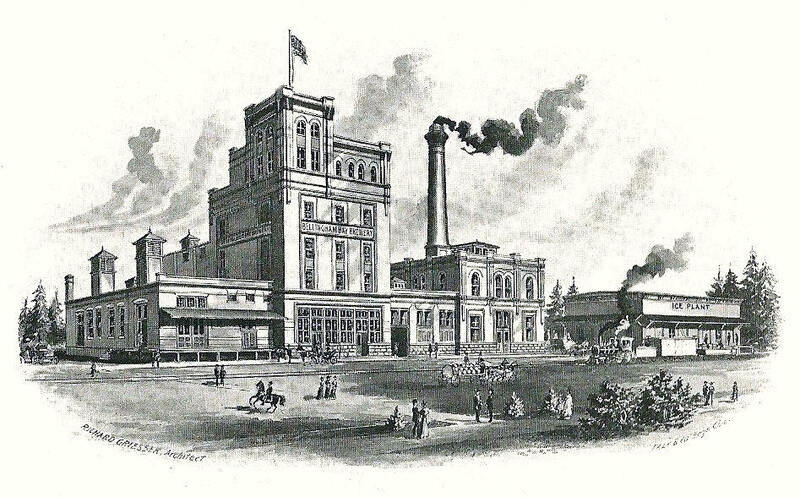 There are many breweries in the United States as large and some larger than this one, but none with such a combination of modern machinery and appliances. All the latest and most modern appliances known to the manufacturers of beer have been installed in this magnificent plant without regard to cost. When completed it will have cost from $250,000 to $300,000. The brewery is located on North Elk street; it is an imposing five-story structure, with a frontage of 182 feet, 85 feet high and 84 feet deep, a brick smokestack 100 feet high, fourteen feet in diameter at its base and seven feet on top. The structure is built entirely of stone, brick and iron with concrete and asphalt floors and may be classed among the few fireproof buildings in Washington. It required in its construction one million bricks, forty carloads of stone, ten carloads of cement and eight carloads of structural iron, besides the lime, sand, concrete, stone, etc. The structure was built after the plans and specifications made by the well known brewery architect, Richard Griesser, of Chicago, and the construction was superintended by Robt. Weismann, of the same city, who has been busily engaged ever since the 10th of January in pushing this work to completion. This brewery has many unique features, chief among them which is its equipment. 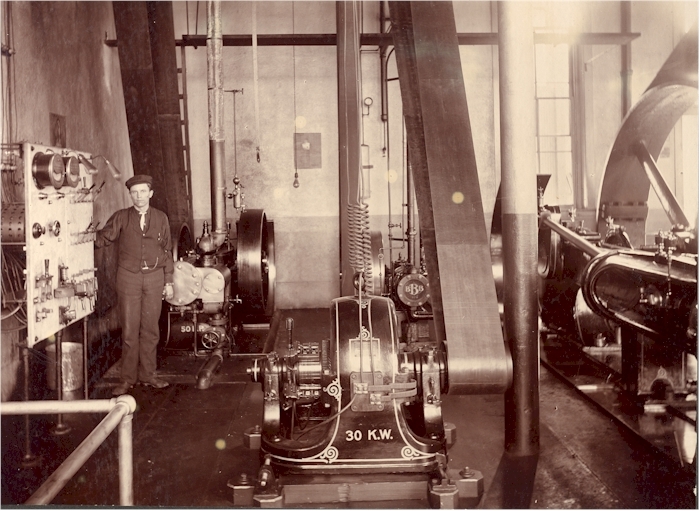 The brewhouse (right) and cellars are furnished the most modern appliances known to science in the art of brewing. Among the most noteworthy of these appliances may be mentioned the Jos. Schneible Co. system which stands unique in its simplicity and perfectness for producing a healthful, brilliant and sparkling beer. This system has never before been installed in any brewery on the Pacific coast, although it is well known in the east in the larger breweries. Most of this machinery will be electrically driven by separate motors, distributed through the various floors and rooms. The building is also lighted throughout with electricity, the company furnishing its own current. 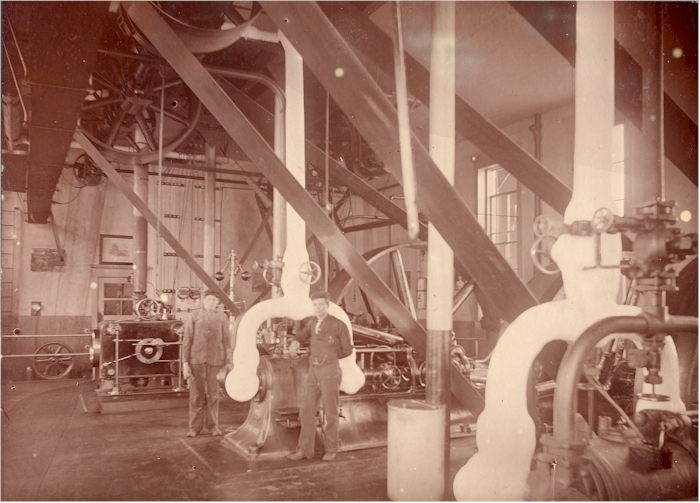 The most prominent features in this machine room (left) are a 150 horsepower Corlise engine and two forty- ton ice machines, furnished by the Vitter Manufacturing Company of Milwaukee, Wisconsin. There is a 65 horsepower Ide high-speed engine, one 300 volt dynamo, various large power pumps, a Gardner Air compressor, and a complete carbonic gas-collecting plant and compressor. 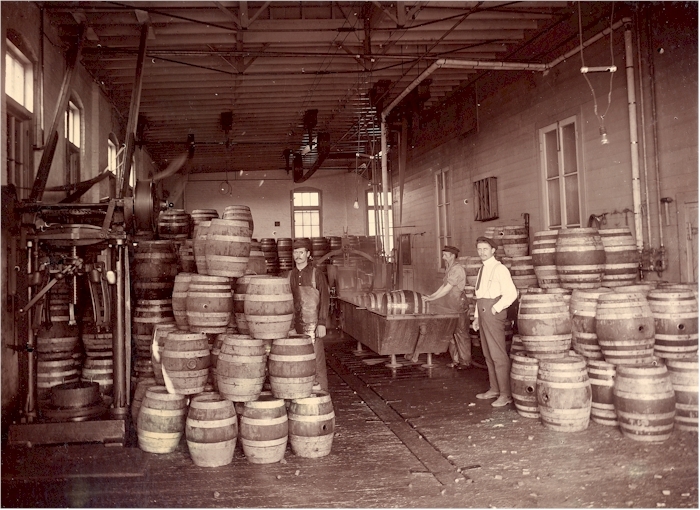 The wash house (right) and racking room are furnished with the most modern and improved labor-saving devices so far invented for the use of breweries. This plant will have the capacity or rather yearly output of 50,000 barrels of beer. To Mr. Leopold F. Schmidt, president of the Olympia Brewing Company, Olympia, belongs the credit of selecting Whatcom for this great enterprise, he having long ago recognized the advantages and great future of Whatcom and Whatcom County. Mr. Schmidt is well known for his great business ability and boundless energy, upright, straight and strict in his dealings and has the esteem of all his fellow citizens and there will be no question but that he will make as grand a success of this new plant as he did out of the now famous Olympia brewery. "We claim to make a beer freer from any foreign matter by the Schneible system than can be made by any other system known to the manufacturers of beer. While the beer is being manufactured under this system it never comes in contact with the atmosphere and is consequently free from microbes and all foreign substances which naturally exist in beer that is exposed to the atmosphere while being manufactured. All the air that is used is sterilized and filtered besides. The beer manufactured by this system contains no fermented substance when it goes on the market, unlike beer made under any of the old systems. In one of the filters alone there are forty sheets of ducking through the beer passes under pressure while hot. The finished beer is filtered under a very low temperature. This operation is also carried on under heavy pressure." 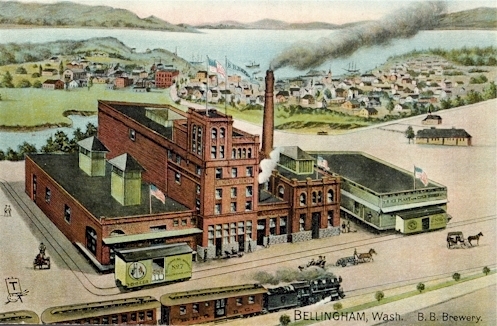 The Bellingham Bay Brewery Company occupies nearly an entire block of ground with its brewery, storehouses and ice plant. It is admirably situated on the B.B. & B.C. railroad and has a side track of its own to which cars from any of the roads may be switched. The cellar of the brewery has a storage capacity of 50,000 barrels (left) and by using the brew-house 100,000 barrels of beer can be stored in the establishment at one time. Six carloads of malt have already arrived and there are five more cars on the road. An addition to the new ice plant (right), that was erected a year ago, will be enlarged to almost treble its present capacity, which will be about twenty tons of ice daily." Through November and December of 1902 local newspaper ads proclaimed: "On the First Day of the New Year - will appear - Bright and Clear - 3-B BEER." 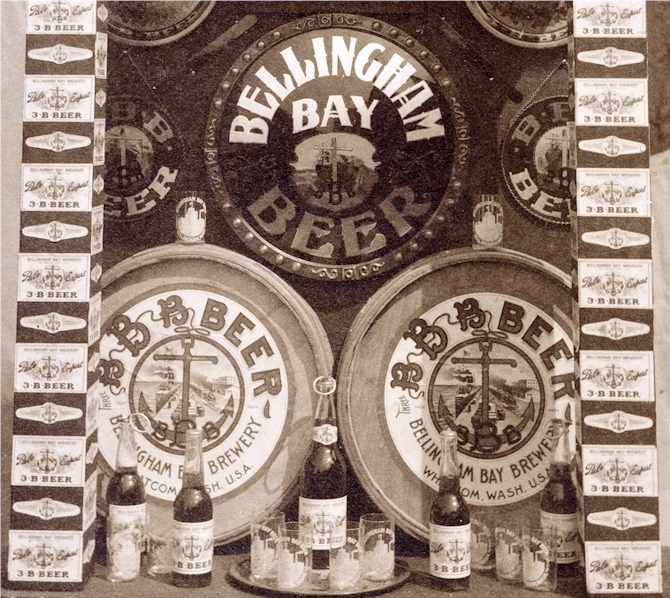 On the 30th of December an inaugural reception and banquet was hosted at the brewery, continuing the next day with a gala New Years Eve celebration, where the public was treated to the first batch of "Bellingham Bay Beer" or "3-B Beer" as it became popularly known. 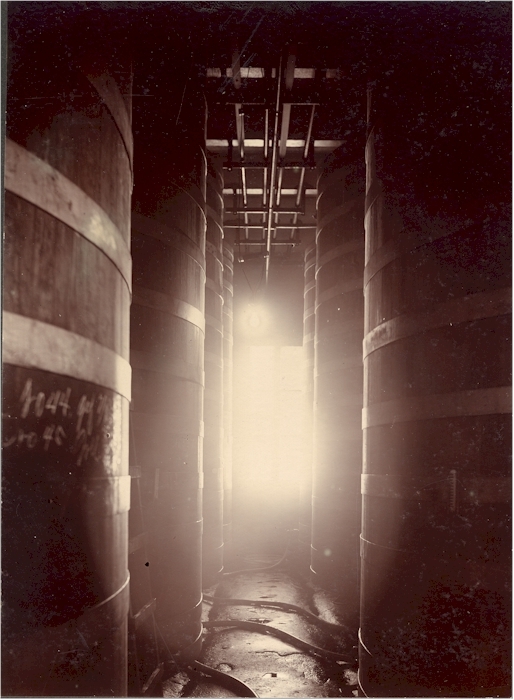 On January 17, 1903, the Fairhaven Times reported that "3-B is turning out 400 barrels per week." On 30 June, the city of Whatcom licensed the brewery for retail sales to the public. 3-B's beautiful color plate (above) first appeared in the 1904 Whatcom City Directory opposite the Brewery's listing. The brewery's first label (below) depicted three honey bees as an obvious play on the 3-B brand name. When registered the company stated that the trade mark had been in use since 31 Dec. 1902. 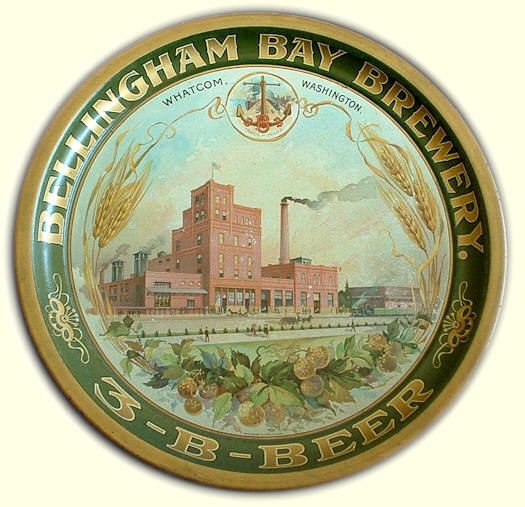 Also the label uses Whatcom instead of Bellingham, which became the city's name on October 1904. When Whatcom was removed from the label, so were the "three bees" and they were no longer a part of the brewery's trade mark. With the brewery on-line 3-B now had to secure the local market, as well as a west coast market, to utilize its capacity and maximize profits. The only local competition was from the Whatcom Brewing & Malting Co., and "imports" from Seattle and Tacoma. Founded in 1899 by Fritz Grathwohl, and after an unprofitable two and a half years, he sold out to a group of Bellingham businessmen for $20,000. This group was comprised of the brewery's superintendent and local saloon owners - and it appears that Leopold Schmidt was behind this takeover. The new management invested in improvements and initiated an aggressive advertising campaign. It was now at full capacity and enjoying an increased demand for its product. The 3-B had been in operation a mere two weeks when Schmidt completed his planned takeover. 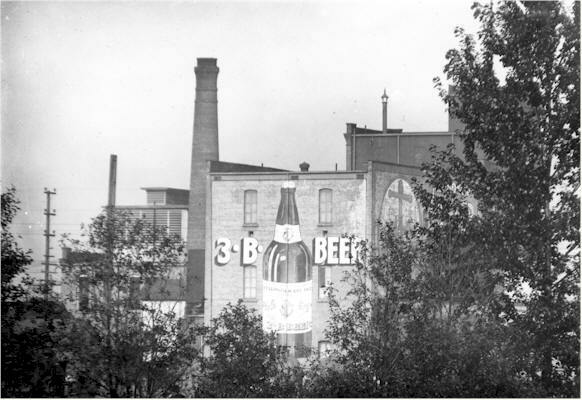 On 13 January of 1903, after only nine months, the revitalized brewery was absorbed by 3-B for $50,000. A number of the saloon owners took stock in 3-B for part of their holdings, and all ten saloons were now "tied-houses." Dealing with the "imports" required a different strategy. With the hometown advantage, 3-B made its presence known in the town's many saloons through intensive promotions and "sweetheart" deals to pour 3-B Beer to the exclusion of all others. Thus established brands like Rainier Beer from Seattle Brewing & Malting, and Pacific Beer from Tacoma's Pacific Brewing & Malting, saw their market share dwindle. 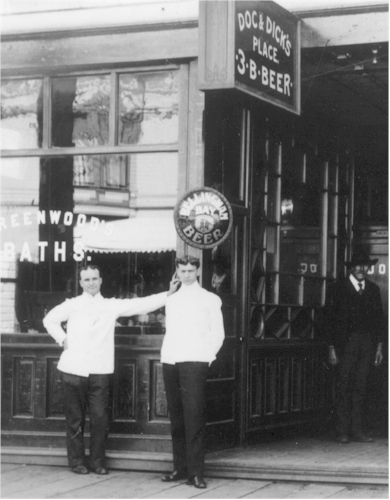 Saloons were also important in introducing the 3-B Beer to Fairhaven & Whatcom - soon to become Bellingham. Tokens for a free glass of 3-B Beer, and a tin bar spinner (right) are examples of promotional items given to saloon patrons. "Two dozen ½ pint bottles of 3-B Beer - Delivered to your home for $1.00 - Just think of it, it's cheaper than city water. Try a case." 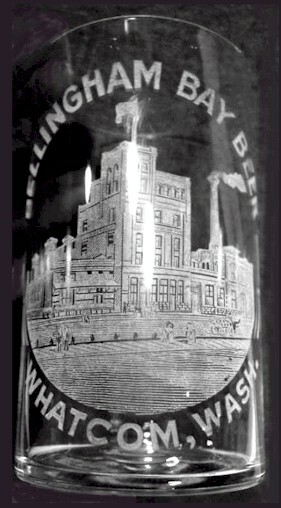 The half-pint bottles (above) mentioned in the ad were manufactured by the Holt Glass Works of West Berkeley, CA. Since the bottles read "Whatcom" instead of "Bellingham," we know that these bottles were made prior to the town's name change in October, 1904 - and were probably the same bottles mentioned in the 1903 announcement above. With the change in the city's name it would be expected that new bottles would have been ordered to reflect the change, but no such bottles have been found. Even if they re-ordered bottle with the original bottle mold, none could have been made after April 18, 1906 when the SF earthquake destroyed the Holt Glass Works. 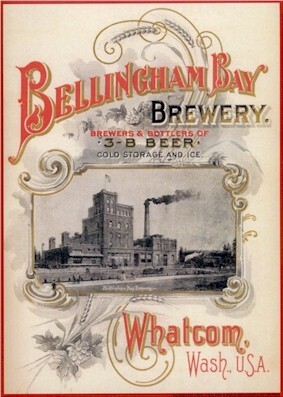 The Brewery did however, change "Whatcom" to "Bellingham" when they replaced the original crates. 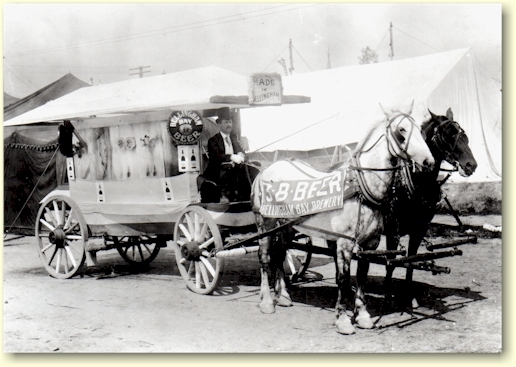 The cases of beer were delivered by a fleet of horse drawn wagons, in the same manner that the milkman delivered his wares. All of the beer bottled at the brewery was bottled with "modern" crown closures. The bottles were un-embossed, clear or amber colored glass, which then had paper labels affixed (left). 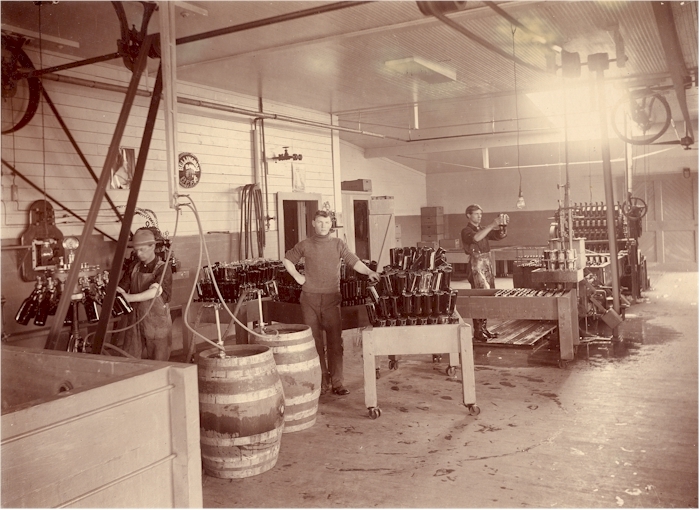 The brewery's Bottling House (right) shows quart bottles being filled. The breweries used any method to promote their product, and what better vehicle than a parade wagon? They also entered displays of their goods at fairs and expos. 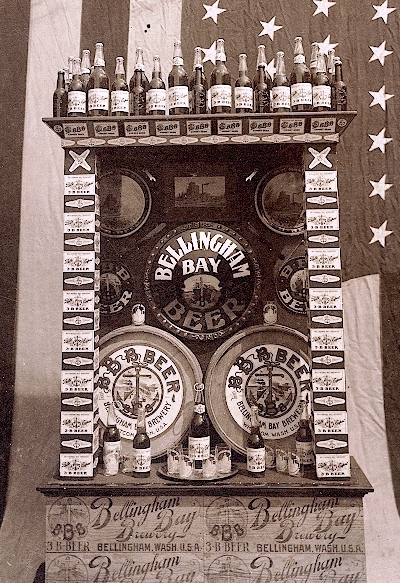 This display was no doubt photographed because it won a medal (for best brewery display) at the 1905 Lewis & Clark Exposition in Portland. It showed many of the promotional items from the Brewery, including signs, bottles, trays, glasses, foam scrapers, bottle openers, and labels. Among the bottles on top, are the ½ pint, embossed bottles which shows that they were not distributed with a label on the reverse, a point that had been the subject of conjecture. A close-up of the interior of the display shows a reverse-painted-on-glass, convex sign flanked by two smaller glass signs. Below that are two barrel ends with large barrel labels. The taller, quart bottles in front are topped with what appears to be loop pulls, but are actually wire cap lifters, or bottle openers. A nice promotional item was this nickel coated, "clam shell" match safe from 1903 . The match was removed by gripping it in the cutout and lifting the spring loaded lid enough to free it. There are grooved end plates for striking the match. Another popular item was the watch fob. It's made of brass with a gold wash. On the reverse is embossed: "Compliments of Bellingham Bay Brewery, Inc. Bellingham, Wash."
Another way to promote the brand was to own a baseball team. The traditional link between beer and baseball is usually attributed to Colonel Jacob Ruppert, who bought the New York Yankees in 1915. However, it appears that Leopold Schmidt was just as innovative. He sponsored the Bellingham Yankees ten years before Ruppert got his Yankees. Schmidt's team was part of the Northwest league, but only competed in '05. While his Bellingham Yankees never produced the likes of the class-A Bellingham Mariners', Ken Griffey, Jr., it was still a local hit. 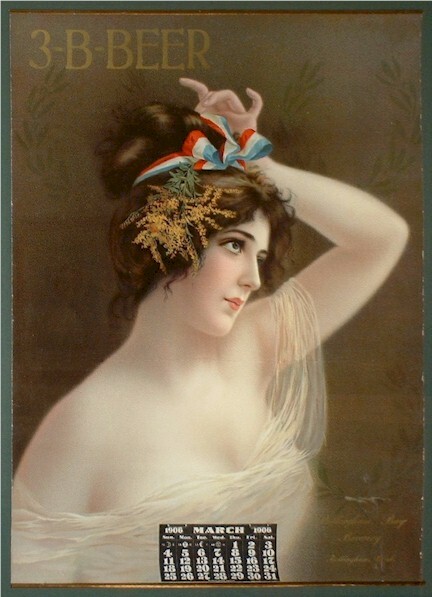 The most widespread method used by breweries to promote their brand of beer was to place their name on various items utilized by the primary purveyors - the saloons. The most obvious was the outdoor signs many of which were quite decorative. Most were "reverse-painted-on glass" or porcelain, and are highly prized by collectors. 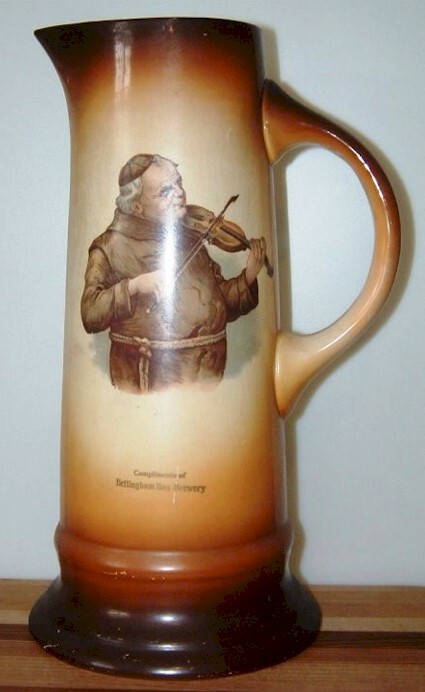 Another desirable item used to promote the brewery was the beer stein. 3-B had an especially nice example which, due to the cost of manufacture, must have only been given to special accounts or share holders. Schmidt apparently contracted with the same German manufacturer to make steins for all three of his breweries. 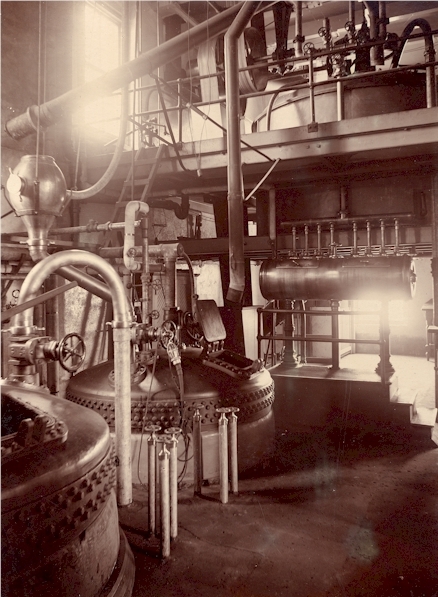 The steins for the Olympia, Salem, and Bellingham breweries are identical, and came out at the same time, in 1904. This set of three can be seen on the Olympia Brewing Company page. Other steins were used as enticements, most of which depicted monks in various activities - usually related to the consumption of food or drink. There were sets of six mugs with a tall pitcher, that came in brown, green or gray. These sets were imported from France and were manufactured by the Lebeau Porcelain Co. The first sets were given away in June, 1906. 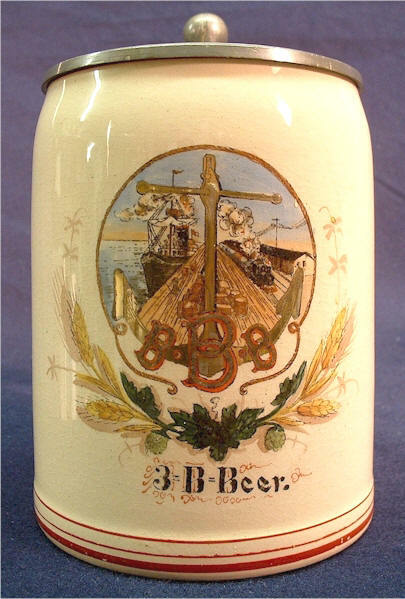 3-B, and the images were used by other breweries. This practice precluded the expensive of commissioning original art work. The brewery appears to have purchased these stock trays exclusively from the Meek Co. (1901-1909) of Coshoncton, OH. 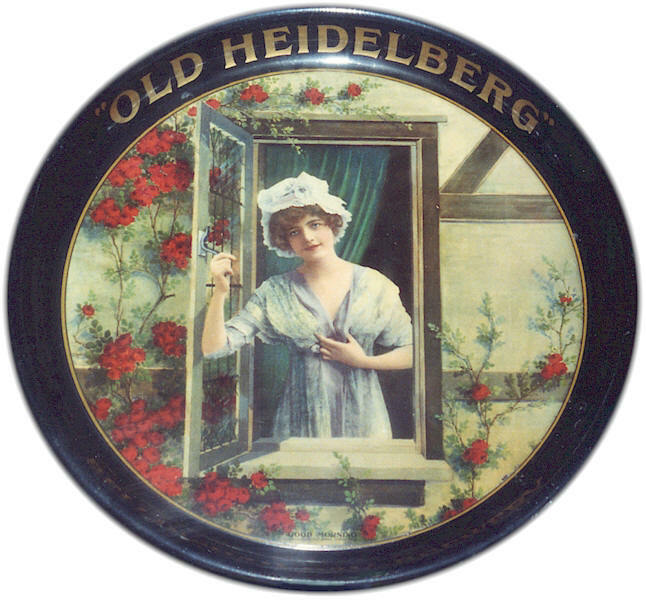 When Jasper Meek retired, the firm remained in business as the American Art Works, and supplied 3-B with the "Old Heidelberg" trays from 1910 to 1914. Cap lifter or "church key" ca.1910. It was meant to be placed on a key chain and had the additional feature of a Prest-O-Lite key. This square hole served as a wrench to open the valve on carbide tanks located on the running boards of early autos. When the valve was opened, it supplied gas for the headlights. 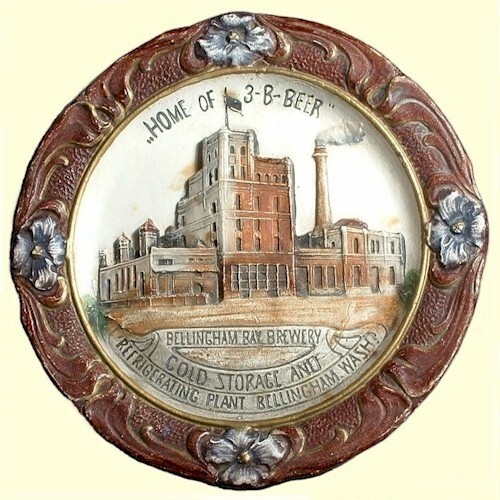 An unusual piece, and one that is unique, is a hand painted display plate depicting the brewery in high relief (below). These were given away with the purchase of a case of beer in December of 1904 and 1905. The brewery referred to them as "Austrian plaques." Each was hand painted and vary greatly in appearance. The beer glass is another item that could effectively promote the brewery's product. 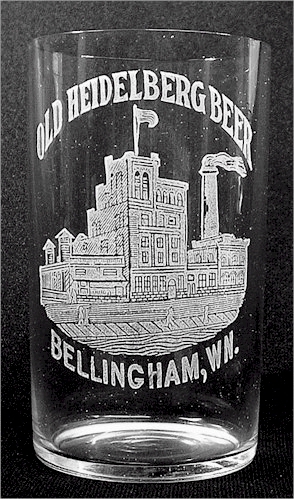 There are three major variations versions of etched glasses depicting the 3-B factory: one has "Whatcom, WA" (1903-04); another has "Bellingham, WA" (1904-10) (below); and the third has the brand "Old Heidelberg" (1910-15). The Old Heidelberg items can be seen further below under the topic heading - "New Ownership." 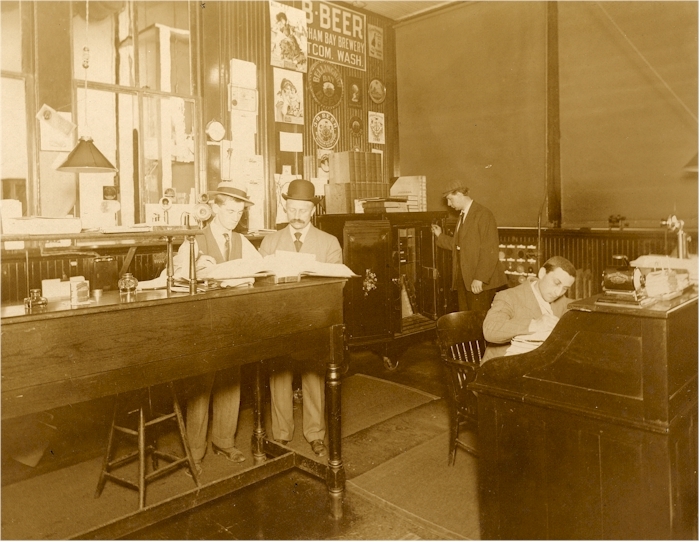 A Brewery photo of the 3-B office (right) with Henry Schupp at work (seated at roll-top desk), also gives a glimpse of some of the advertising pieces on the wall. A close-up shows two calendars and some items from the parent, Olympia Brewing Company. Calendars were another effective way to keep the Brewery's name in the public's eye through out the year. Unfortunately, due to the limited usefulness of these items, few have survived. An exception is this 1906 calendar (left) from the author's collection. 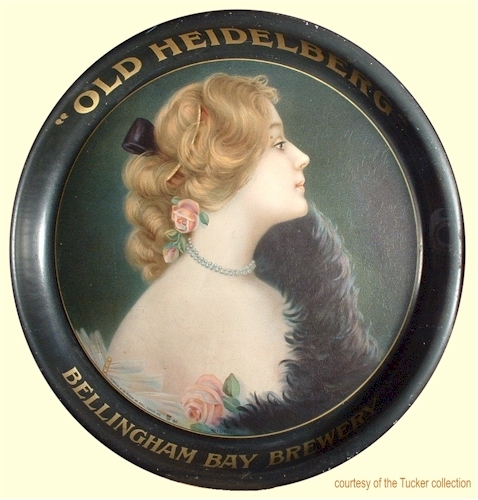 Like most breweries of the period, the Bellingham Bay Brewery served a largely local market. But 3-B also shipped its "Pale Export" to major markets on the Pacific coast, Alaska, as well as Canada. 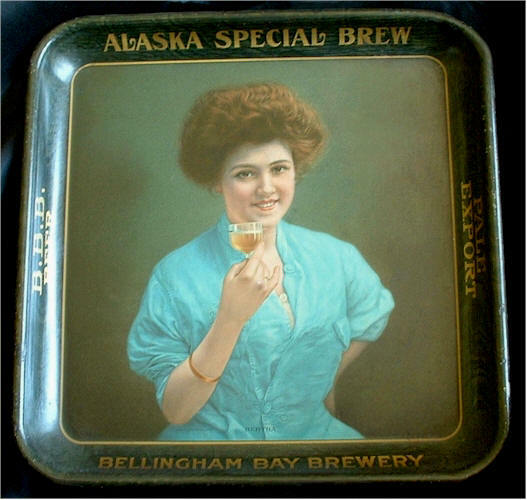 The Alaska market even had its own brand called "Alaska Special Brew" (see square tray above). a city with 27 breweries." Don't be surprised, old chap to find 3-B on tap - They'll have it, dontcher know." It seems odd to think of shipping beer all the way to the Yukon, or the Philippine Island of Luzon, but reflecting on the events of the day, it makes sense. With the Alaskan gold rush, and our occupation forces in Manila after the Spanish-American War, there were obviously marketing opportunities for any brewery set up for long distance distribution. REFRIGERATOR CAR MADE IN BELLINGHAM - The Bellingham Bay Brewery yesterday morning rolled out from its shops a brand new refrigerator car and at noon sent it on its maiden trip with a car load of beer for Cle Elum, where the company owns a large refrigerator. The car was made in Bellingham and is one of the best refrigerator cars that can anywhere be found. The "box" is eight and a half feet high and nine feet wide on the inside. The car is 34 feet long. Its construction cost $1,027. The sides are about ten inches thick. Between the outermost and the second walls is a three-inch space packed with hair. The inner side of the second wall is lined with paper, and between this and the next wall, or partition, there lies an air space which is separated from a second air space by a partition. A fourth wall made of ceiling* which is shellacked completes the structure in the sides of the car. The top is built with a double roof, lined with paper. Joining this is an air space of paper. Behind the shellacked ceiling is four inches of saw dust which completes the structure of the roof. Thorough provision for, protection has been made at the bottom in the construction of a double floor. The space between the floors is packed with a thick layer of charcoal. The exterior of the car is painted yellow. "Bellingham Bay Brewery, Bellingham. Wash.," is lettered on one side of the door. On the other side "3-B Beer," and "Made in Bellingham." The designs on the side of the car also include a painting of the brewery's trade mark, the anchor, ship, wharf and train. The car has a capacity of 40,000 pounds. * Ceiling refers to "beaded ceiling" which is also called beaded board or car siding. We now see these grooved boards used in homes for wainscoting. This 1905 postcard shows two of the refrigerator cars with the numerals six & seven painted on the sides, which would suggest that 3-B owned at least seven of these cars. The above article might lead one to believe that the 3-B manufactured the cars, when in fact their shops merely painted them and added the 3-B lettering & trade marks. 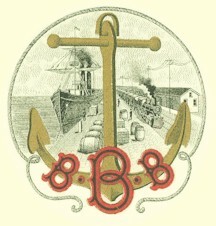 Whether by rail or ship, 3-B had the ability to sell its beer in the huge San Francisco market, and had done so almost immediately. The beer was shipped to the City and then bottled there. 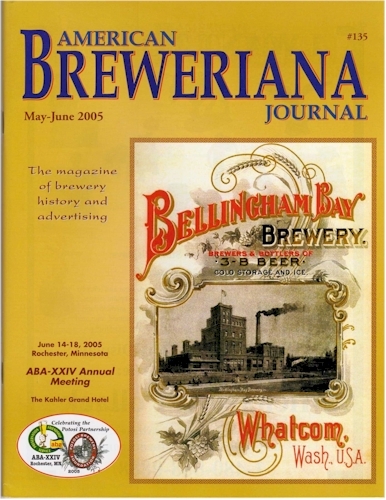 The 1904 SF telephone directory lists the Bellingham Bay Brewery, Inc. at 3109 20th. That was the address of Joseph B. Cuneo, agent for brewery and manager of the 3-B Bottling works. 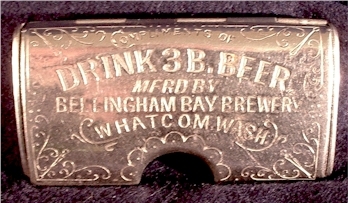 Clearly, Cuneo had the 3-B account in early 1903, since he would have placed his order for the "3-B Beer - Whatcom, Wash." ceramic stoppers prior to November of 1903, when the city's name changed to Bellingham. The 1905 city directory lists Cuneo as the 3-B agent, but prior to the publication of the next year's directory Cueno had been replaced by Diedrech Meinke and while the 3-B Bottling Works is still at the 20th St. location Meinke is using 60 Dorland St. as his office. He remained 3-B's agent/bottler until 1910. Ceramic stopper with the monogram of Joseph B. Cuneo, proprietor of the 3-B Bottling Works in San Francisco, from 1903-1906. 3 B BEER SAN FRANCISCO, CAL"
Made by the Holt Glass Works. 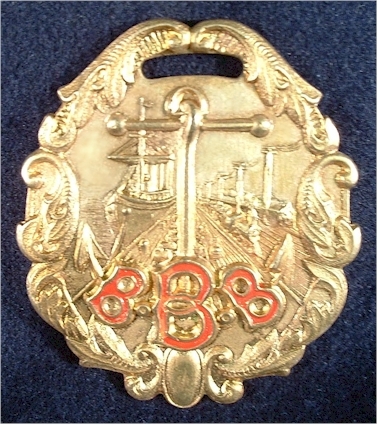 From 1906-1910 the 3-B Bottling Works was under the mgt. of Diedrich Meinke. "D. MEINKE - SAN FRANCISCO." The patent for this cap lifter was applied for in December 1907, so the earliest it could have been used was in 1908. That's when it was issued by the brewery's San Francisco agent, Diedrich Meinke. 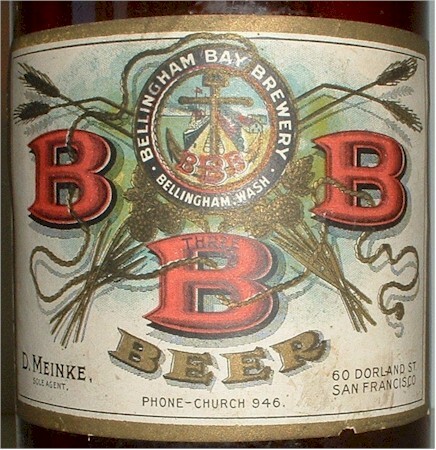 In 1910, when the new operators of the Bellingham Bay Brewery decided not to re-instate his contract, Meinke's 3-B agency was closed. The 1906 San Francisco earthquake provided unexpected opportunities for the 3-B, as well as other northwest breweries. "$1,000,000 ORDER FOR BEER - Local Plant Will Be Enlarged to Meet California Demands. Orders for almost $1,000,000 worth of beer has led the Bellingham Bay Brewery to consider plans for $20,000 worth of improvements in its local plant. The cellar capacity, now about 150 barrels daily, will be doubled and the ice tanks also will be doubled in capacity. A story was recently added to the main building and the other addition will be built on the west side of the structure. The brewery's plans for the $20,000 expansion were completed, doubling its capacity to 100,000 barrels a year. With the loss of brewery production in San Francisco, Leopold Schmidt decided to establish his own brewery in that city. So, in late 1906 the Acme Brewing Company became the newest of Schmidt's breweries. 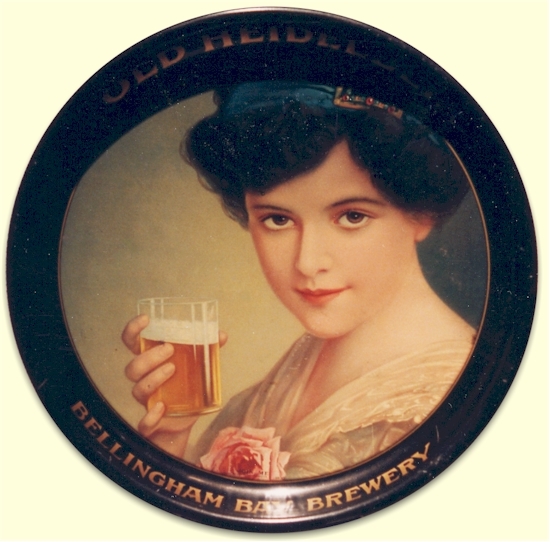 From the time the Bellingham Bay Brewery commenced production, the business was threatened by the era's crusade against alcoholic beverages. The primary adversaries were the Women's Christian Temperance Union and The Anti-Saloon League, both of which were gaining influence with lawmakers. They brew crime of every sort. Sweep away the breweries and the distilleries, and you will secure municipal reform, banish the most prolific causes of poverty, insanity and crime, and clean the cities of most of their moral rottenness. What a crime the manufacturers and dealers themselves commit by making money out of the bodies and souls of men, and wringing wealth from the dripping blood of broken-hearted women and from the hungry mouths of starving innocent childhood! What a hell broth indeed is this which brews poverty and rags, hunger and cold, crimes dyed in a thousand hues, sickness and death to vast numbers, wrecking both body and soul!" With over 60 saloons in Bellingham by 1906, there was no shortage of sensational stories reporting anti-social behavior in these establishments. In 1907, the state enacted Sunday closing law for businesses, which was a thinly disguised "lid" - a ban on Sunday sales of alcohol. As this was most working man's only day off, it was quite a blow to shut the saloons on the busiest day for beer & billiards. 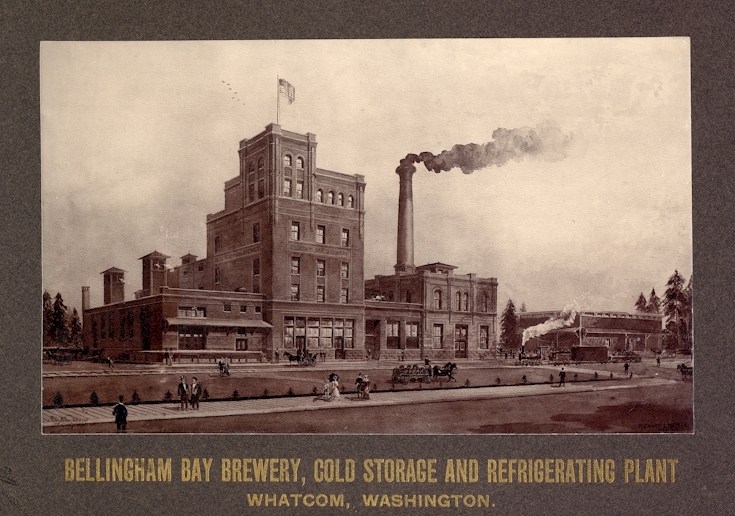 In 1909, possibly because of the lid and expected further opposition in Bellingham, Schmidt purchased the Port Townsend Brewing Company across Puget Sound on the Olympic Peninsula. Apparently anti-saloon sentiments were not as strong in Port Townsend as in Bellingham. 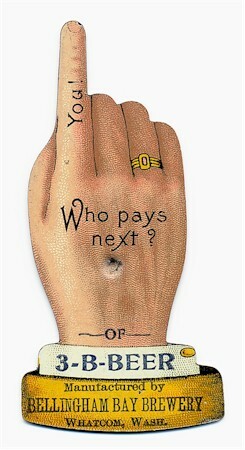 However, later that year the situation grew more ominous for Washington brewers and saloon owners. The State Legislature passed a "local option" bill that allowed each municipality to hold a special election to completely ban saloon operations within their city limits. While Bellingham had yet to vote on whether to go "dry" or remain "wet" the anti-saloon leanings were strong, and a November 8, 1910 election was looming. So Schmidt made some public ultimatums in hopes of thwarting the prohibitionists. 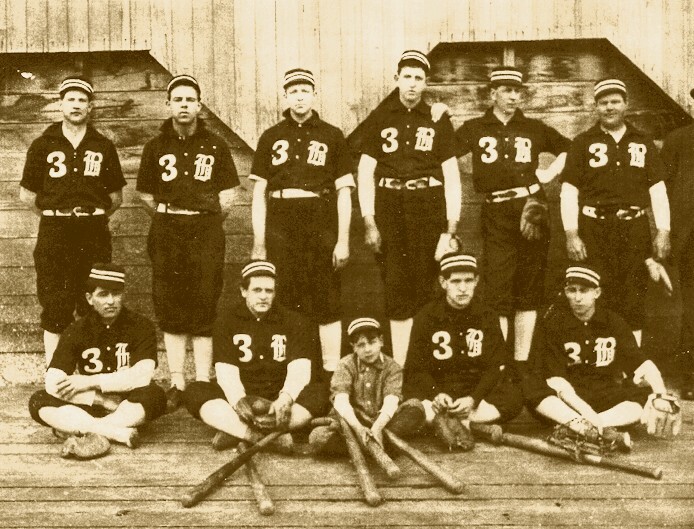 On January 11, 1910 the Bellingham Herald announced that the 3-B was to be sold, however finalizing the sale was contingent upon the local option vote. If the drys win, the recently secured lease, by Andrae & Stowe, will be declared off and the property returned to Leopold Schmidt, president, and Henry Schupp, secretary. They "threatened" that if the City votes dry it is probable the Brewery will close. They added that they were ".. not inclined to operate their own plant in the City because they have all they can handle with their other breweries." Two months later, the Bellingham Herald announced that Schmidt had purchased the Byron Hotel for $100,000. Schmidt said that he bought the property outright to avoid the payment of heavy installments on the lease he had taken out in 1907. Leopold Schmidt and Henry Schupp had earlier recognized the Temperance threat to 3-B, and laid plans to diversify business operations in Bellingham. In October 1907, Schmidt had taken out a 10 year lease on the Bryon Hotel. Now Schmidt and Schupp announced plans to erect a new hotel on the present site, but they warned ".. only if the local option does not carry." Their efforts to effect the election were in vain, and effective January 1, 1911, Bellingham was dry. And it appears that Schmidt's ultimatums were but empty threats. Andrae and Stowe's lease to purchase the brewery was not cancelled, and the Brewery was not closed. Also, in September of 1913 the Bellingham Herald reported that construction of the new Byron Hotel has resumed "on a grand scale." Upon completion the Byron was renamed the Leopold Hotel and had its Opening on May 24, 1914. The Bellingham Herald proclaimed: "Leopold Hotel one of the most modern on the Sound." Unfortunately it's namesake was to enjoy the fine new hotel a mere four months. On 24 September, Leopold Schmidt died in his suite at the Hotel. On 7 January, 1910, Leopold Schmidt announced in the Bellingham Herald that he had leased the brewery and ice plant to Pierre J. Andrae and Edward L. Stowe. The lessees also had an option to buy the plants at any time within a period of five years. Pierre Andrae was an experienced practical brewer and also well versed in the theoretical and scientific part of his profession, being a graduate of the Wahl-Henius Institute in Chicago. During the previous four years he had been in charge of the brewing operations at the No. Yakima Brewery & Malting Co. Despite the victory of the drys, and due to loopholes in the local option legislation, the Brewery could remain open. Andrae & Stowe then began selling the 3-B's output under the brand Original Heidelberg (below left). While all the saloons were now closed, one could still consume alcoholic beverages in their own home, and the brewery could make home delivery of sealed cases. The Brewery could also ship its beer outside of the city limits, and out of State. Since California was still its largest market the business remained solvent. However, for reasons unknown, Andrae left the business on April 12, 1911, after selling his share to Stowe. 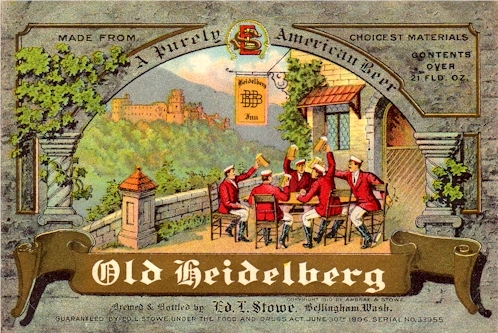 In August of 1911, Stowe changed the brand name from Original Heidelberg to Old Heidelberg (above right). He also adjusted the wording on the label. The "Original" label claims the beer to be "Old Type German Beer" but the label was changed to say: "A Purely American Beer." This may have been a response to growing anti-German sentiments resulting from the increase of German imperialism in Europe. He also changed the monogram at the top of the label from A. S. for Andrae & Stowe, to an E. L. S. monogram for Edward L. Stowe. 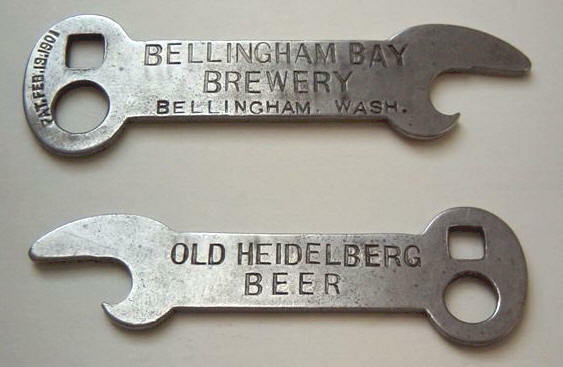 The new company continued to use beer trays and etched glasses as promotional items for the Brewery, with "Old Heidelberg" replacing "3-B" or "Bellingham Bay Brewery." The trays shown below were all stock trays manufactured by American Art Works, of Coshoncton, OH, successor to the Meek Co. While able to survive under the sanctions of the "local option," the Brewery was about to be dealt a fatal blow. In 1910 women had been granted the right to vote, and the Woman's Christian Temperance Union was still at work. So it's no surprise that on November 3, 1914, Washington State citizens voted to prohibit the manufacture and sale of alcohol, including beer. Shortly before the Statewide Prohibition vote, Leopold Schmidt passed away. He spent his last days at his Leopold Hotel in Bellingham, dying on September 24, 1914, without having to witness the destruction of his brewery business. Prohibition was to take effect on January 1, 1916. Stowe immediately announced plans to sell his remaining stock and pack up the brewery's equipment for San Francisco, however Stowe's plans were set aside and his brewing days were over. In March of 1916, the ice plant and cold storage was leased to Fritz (Fred) Reither, and the Lang brothers, Will and Fred. Fritz Reither was a nephew of Leopold Schmidt, and had been employed at 3-B since 1907. Prior to that he had run the Olympia Beer Company's bottling operation in SF. Then, on 28 May 1916, the brewery was sold to an Olympia group with plans to utilize 3-B's remaining equipment to make fruit drinks. The plant was to operate as a branch of the Schmidt family's Northwest Fruit Products Company and the three ex-breweries were depicted on the company's letterhead. The Salem plant was already making a Loganberry product called Loju and the Olympia plant a sparkling apple champagne called Applju. 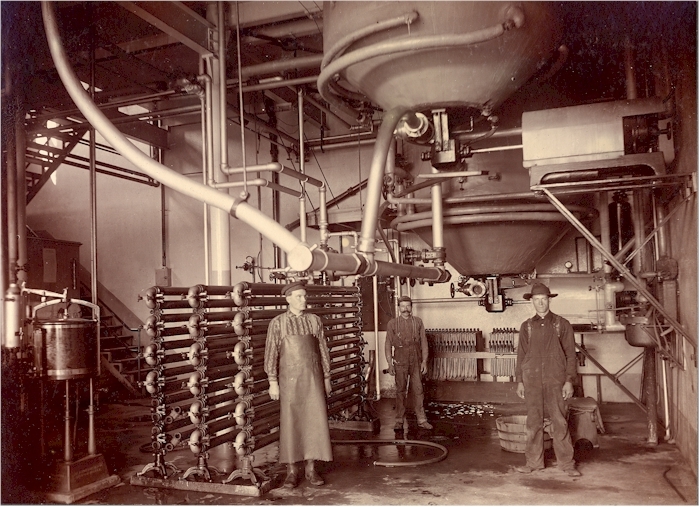 The plans for manufacturing fruit juice did not materialize, but the Bellingham Ice Company continued under the management of Reither and the Langs. 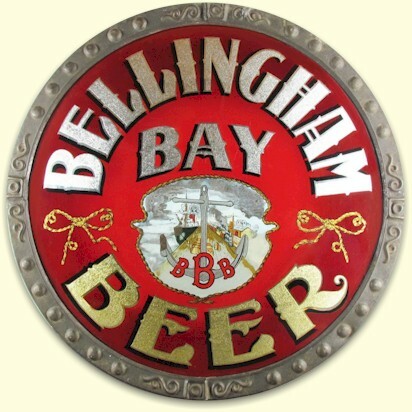 On March 19, 1917, stockholders of the Bellingham Bay Brewery met for the final time and unanimously opted for dissolving the corporation. In July, 1918, Floyd Dillabough bought the former Bellingham Bay Brewery and converted it into a new home for his Royal Dairy Products Co. The cold storage annex lent itself well to the making of ice cream. The keg shed was used for "milk evaporating" and the wash house became a creamery. The Royal Dairy continued to lease the ice plant to the Bellingham Ice Co., but now it was marketed under the Royal Dairy's brand, Crystal Ice. The Whatcom County Dairyman's Association and Darigold used the building from 1927 to 1967. After Darigold moved out, the old brewery would remain vacant until being torn down on February 8, 1970. 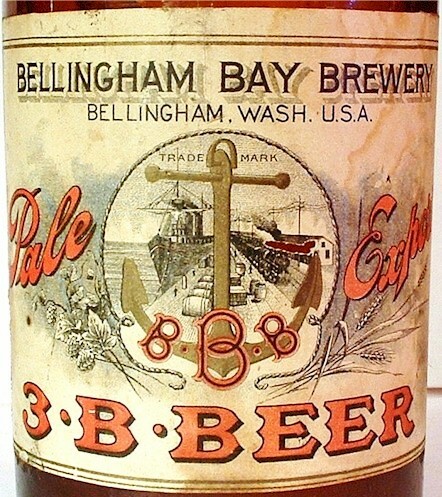 While no attempt was made to re-open the Bellingham Bay Brewery when Prohibition was repealed in April, 1933, there were two attempts to establish a new brewery in Bellingham. "Bellingham---Construction of Bellingham's new brewery with a capacity of 15,000 barrels a year, begins today, W. W. Fairburn, president of the Whatcom-Skagit Brewing Company, the builders, announced. Manufacture of Spring-Water Brew will begin about November 1st." Property was leased from the Port of Bellingham and a structure was built for the brewery. However, due to under capitalization the brewery never reached production and the enterprise was canceled in 1934. The next attempt to open a brewery came two years later. The February, 1936, issue of Western Brewer reported that Ed Stowe has organized a company to operate a brewery on a site acquired in the Eldridge Industrial District. Again, the project never reached the production phase, but not for lack of brewing expertise. This was the same Ed Stowe who had operated the Bellingham Bay Brewery from 1910-1915. 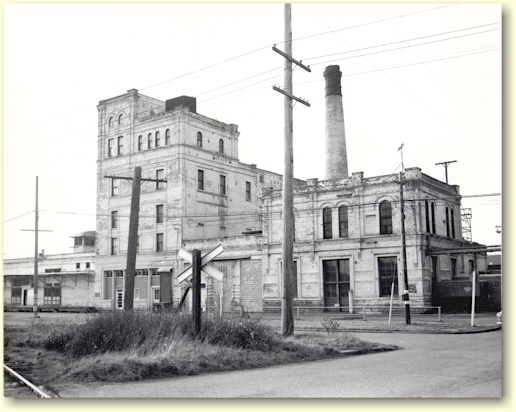 The Eldridge Industrial site chosen by Stowe, was located at 2925 Roeder Ave., and was the same structure built for the proposed Whatcom-Skagit Brewing Co. As late as 1949, the Port of Bellingham still referred to it as the "brewery building." WARNING - I've seen phony match safes from seven different WA breweries - all with graphics taken from my history pages. The fakes I'm aware of are supposedly from: Hemrich Bros. Brewing Co.; Seattle Brewing & Malting; Bellingham Bay Brewery; Aberdeen Brewing Co.; Albert Braun Brewing Assn. ; Columbia Brewing Co.; and the Washington Brewing Co. of Everett. While the Bellingham Bay Brewery is long gone, Bellingham still has a brewery to be proud of. The Boundary Bay Brewery on Railroad Ave. is producing award wining beers. On June 1, 2007 the North American Beer Awards were held in Idaho Falls, ID. Boundary Bay brought home a gold medal for their "ESB," a silver for their "Dunkles Bock," and a silver for their "10th Anniversary Ale." In the '08 NABA, Boundary took home a silver for their "Cabin Fever." 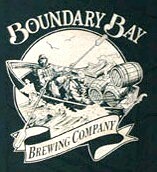 And in Dec. '09, Boundary Bay was awarded Best Brewery in Washington State by the Readers Choice Awards in the Northwest Brewing News publication. And, the Bistro and serves excellent food as well! If you come to Bellingham - and you enjoy good food, expertly crafted beers, and live music - Boundary Bay Brewery & Bistro is not to be missed. Thanks to the late Isabel Stowe, widow of Edward R. Stowe, Jr., for providing artifacts from the Bellingham Bay Brewery. Edward L. Stowe, Sr. was the last proprietor of 3-B. To Steve Stimson, for allowing me to use his family's photos of the interior of the brewery, and for the great "finger" saloon spinner. Steve's mother was the niece of Henry Schupp, who managed the Brewery from 1901 to 1910. To collectors: John Rauch, and Jim Doidge, for allowing me to copy images and photograph their 3-B artifacts. To Jeff Jewell, photo historian for the Whatcom Museum of History & Art, for graciously sharing his historical research and images from the photo archives. To John Cartwright for the image of the cap lifter. To Dr. Thomas Jacobs for the images of the 3-B labels on the embossed quart bottles, and for data on the SF bottlers, Meinke & Cuneo. To Bryan Anderson for the Original Heidelberg label. To Mike Magnussen for the "Monk" mug. 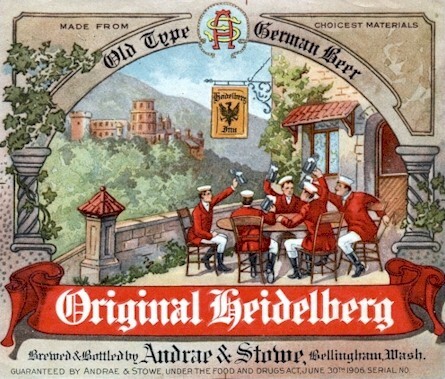 To Ben Strom for the Old Heidelberg label, the parade wagon photo, and the photo of brewery from the 1960s.